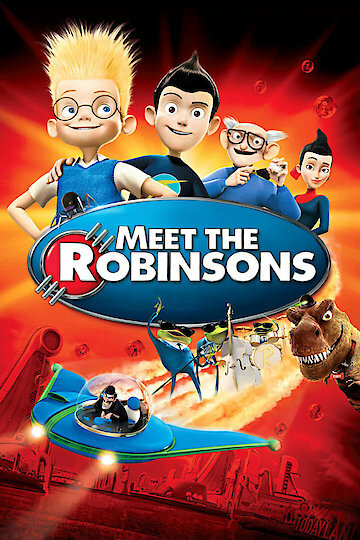 Meet the Robinson is an animated family film. Lewis lives at the orphanage and he is an inventor. His inventions have been running the potential parents away. Lewis is determined to find his mother. Lewis invents a machine in which he can scan his memory to find his mother. Lewis craves the love from his mother and he must find her. Michael Goob Yagoobian is Lewis's roommate and his invention keeps Goob awake. Lewis completed his memory scanner and takes it to the school fair. At the school fair Lewis meets Wilbur Robinson a boy who claims he is a cop from the future. Wilbur tells Lewis he needs to find a time machine so he can find a man who stole a bowler hat. Lewis is discouraged when his memory scanner falls apart and ends in failure at the science fair. Lewis leaves disappointed. However the bowler hat guy and a robotic bowler hat Doris repairs and steals Lewis' memory scanner. Wilbur meets Lewis and wants to talk about his memory scanner, but Lewis wants Wilbur to prove that he is indeed the time machine. Wilbur proves he is by taking Lewis to 2037 in seconds. Lewis is intrigued with the time machine and wants to use that instead of his memory scanner. Wilbur gets upset and the two get into an argument. Wilbur wants Lewis to fix the time machine and he agrees only if he can use it to meet his mother. Wilbur hides Lewis in his garage. The Robinson eventually meet Lewis and wants to adopt him but changes their minds when they discover he is from the past. It's not until the end that Lewis meets Cornelius the father which is an adult version of himself, and as promised Wilbur takes Lewis in time to see when his mother dropped him off at the orphanage. Lewis almost stops her but realize that he has a family. Lewis is taken back into his time and successfully completes the memory scanner at the science fair. Lewis is adopted by one the judges Lucille and her husband Bud. The motto at the end was just keep moving forward. Meet the Robinsons is currently available to watch and stream, download, buy on demand at Netflix, Amazon, Vudu, Google Play, iTunes, YouTube VOD online.